Creating a digital marketing strategy that generates leads and closes sales all while sticking to a budget is easier said than done. It's impossible to know how well your marketing efforts are working without reporting on key data to ensure you're on track. That's why we put together a digital marketing scorecard template - to allow you to track your KPIs each month to help both your marketing and your sales teams stick to goals and remain accountable. A dynamically updated KPI section based on the data you provide so that you can focus on your most important metrics. A deep dive into visitor, lead and sales data you should be tracking each month. A 6-month sales scorecard and a 6-month marketing scorecard to track specific efforts that impact your bottom line. Instead of starting from scratch, this scorecard will allow you to track your most crucial data as well as focus in on specific marketing and sales data that contribute to your business reaching its overall goals. 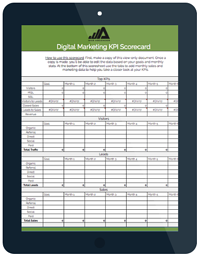 Fill out the form to access the free digital marketing KPI scorecard.